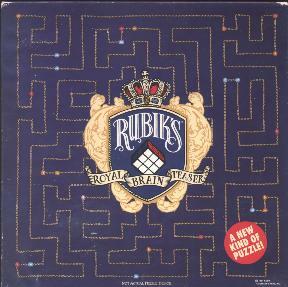 Rubik's Royal Brainteaser Puzzle is a jigsaw puzzle made by Springbok. The picture it is supposed to form consists of a long loop of chain which visits every puzzle piece once, and where each piece shows a single jewel bead on the chain. These beads can be square or round, and are red, yellow, blue or grey. There beads occur in a particular sequence on the chain. There are some clues to this sequence on the box, though that is not much help. The finished puzzle is square, and has 21×21=441 pieces. There are in fact two sequences to deal with - the sequence of bead colours, and the sequence of bead shapes. These are completely independent of each other. The basic colour sequence consists of one red, two blue, three yellow, repeated all the way along the chain. Occasionally however there is a square grey bead, and the sequence is then reversed so that the square grey bead is like a mirror with identical colours on either side. The basic shape sequence if very similar to that of the colours - it consists of one round, two square, three round, one square, two round, three square, repeated all the way along the chain. It is therefore again a 1-2-3 sequence, but of alternating shapes instead of colours. Occasionally there is a round grey bead, and the shape sequence is then reversed so that the round grey bead is like a mirror with identical shapes on either side. The picture below shows the solved arrangement.